As Gunners, we are denoted by an especially rich array of distinctions and customs which recall our history, underlie our ésprit de corps and help define our identity and ethos. The most prominent of these are summarised on this page. For a complete and authoritative listing, please refer to Regimental Standing Orders – Volume I. The honour of “the right of the line” (precedence over other units), on a army parade, is held by the units of the Royal Canadian Horse Artillery when on parade with their guns. On dismounted parades, RCHA units take precedence over all other Canadian Army units except formed bodies of officer cadets of the Royal Military Colleges representing their college. RCA units parade to the left of units of the Royal Canadian Armoured Corps. See Regimental Standing Orders for precedence and seniority within The Royal Regiment. 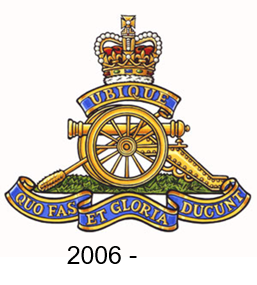 The Royal Regiment of Canadian Artillery has two Regimental mottos: “Ubique” (Everywhere) and “Quo Fas et Gloria Ducunt” (Whither Right and Glory Lead). In 1832, His Majesty King William IV granted The Royal Regiment of Artillery the right to wear on their appointments the Royal Arms and supporters over a cannon with the motto, “Ubique Quo Fas et Gloria Ducunt” (Everywhere Whither Right and Glory Lead). The next year (1833), the order was amended to make clear that “Ubique” and “Quo Fas et Gloria Ducunt” were two separate mottos. The word “Ubique”, takes the place of all past and future battle honours in recognition of the artillery’s widespread service in all battles and campaigns. Both the motto and Ubique may be borne on Regimental appointments. The Royal Regiment of Canadian Artillery was authorized to wear on its appointments “Quo Fas et Gloria Ducunt” and “Ubique” by His Majesty King George V on 5 August 1926. 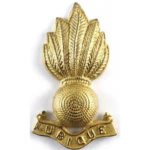 The usage of “Ubique” was confirmed by the CDS on 11 May 1994 (NDHQ 1065-1 (ADM (Per)) dated 9 May 94). 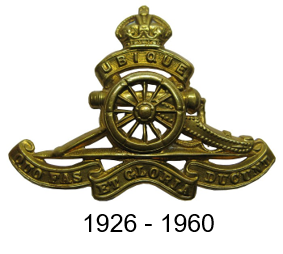 Before 1832, the Royal Artillery used the Ordnance Arms or the Royal Cypher as part of the insignia on its buttons and badges. The Ordnance Arms had as their central devices three cannons and three cannonballs. The Royal Cypher consisted of either the garter and motto surmounted by a crown enclosing the monarch’s monogramme or the monarch’s monogramme alone surmounted by a crown. In 1832, the Royal Arms with supporters, together with the mottos “Ubique” and “Quo Fas et Gloria Ducunt” and cannon were granted to the Royal Regiment of Artillery as a badge by warrant of His Majesty, King William IV. In this form, it constituted the full achievement of the Gunner badge. For the next hundred years, it was featured on shako stars, helmet plates, shoulder belt plates, sabretaches, cross belt pouches and busby plume holders. 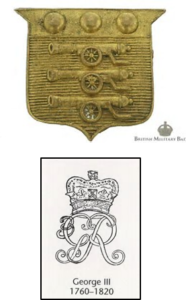 Canadian Gunners adopted the “Full Achievement of the Badge” and it was used from 1855 as a helmet plate, on sabretaches and cross belt pouches. “Canada” was used instead of the motto “Ubique”. Letters Patent approving the Badge of The Royal Regiment of Canadian Artillery ensigned by the Royal Arms of Canada. As uniforms were simplified to meet the demands of modern warfare, it became apparent that the full achievement of the gunner badge was too large. 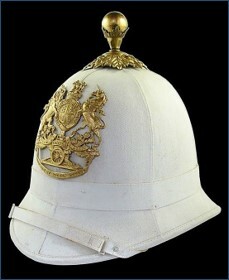 Beginning with the introduction of the peaked forage cap in 1907, abbreviated versions of the full achievement have been adopted for day to day use. In 1960, a new heraldic drawing of the badge was executed which replaced the Tudor Crown with the St Edward Crown worn by Elizabeth II. 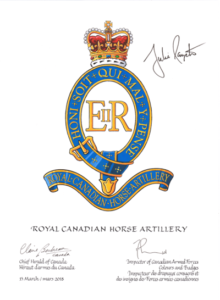 Royal Canadian Horse Artillery units are distinguished by the presence of the Royal Cypher on some of their appointments. The RCHA Badge (or Garter badge as it is sometimes termed) is based on the badge of the Order of the Garter which dates from 1348. The motto on the cypher is “Honi soit qui mal y pense” (“Shame on him who thinks this evil”3), and is the motto of the Order of the Garter, not an artillery motto. The background colour, including the centre of the garter is the colour of the material on which the crest is mounted. The Colonel Commandant approved the design and colour of the RCHA badge on 22 February 1961. This badge may be used on RCHA unit flags, plaques, stationary, silverware, and decals. 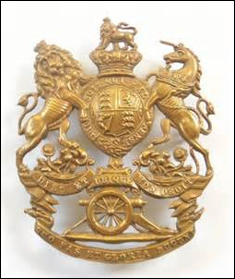 The RCHA Badge design is based on originals prepared by the College of Arms in 1949 as reproduced in The Journal of the Royal Artillery, Vol LXXVII, No 1, January 1950. When it is displayed with The RCA Badge, The RCHA Badge shall take precedence. The grenade, like St. Barbara, has a common heritage with all those who work with explosives and pyrotechnics – artillerymen, engineers, grenadiers and fusiliers. The word grenade derives from the ancient French “pomme grenate” or “pomme granate”. Heraldically, the grenade is depicted as a sphere spouting flame. The relation to the pomme granate is retained in the orifice-like appendage from which the flame spouts. The grenade was first worn by gunners in the mid-1880s as both a collar badge and a cap badge on the coloured field service (wedge) cap. The grenade used was the universal grenade which was also worn by the engineers and by several fusilier regiments. In 1907 a revised grenade was adopted with a more stylized flame and “Canada” in a scroll underneath. At this time the convention was established to depict the artillery grenade with seven flames. The Engineers adopted a grenade of the same pattern but with nine flames. The Fusiliers retained variations of the universal pattern grenade. 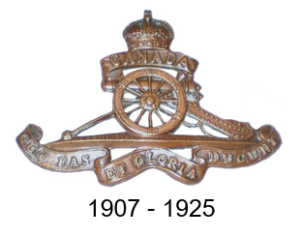 At the time of the adoption by The Royal Canadian Artillery of the motto “Ubique” in 1926, that motto replaced “Canada” on the scroll beneath the grenade. With minor variations in size and material, the grenade continues in use today as the collar badge of The Royal Regiment of Canadian Artillery. In Great Britain, guns were originally inscribed with the “Founders Mark” of the private foundry that manufactured the guns. By contrast, in France, the arms of the reigning monarch were customarily inscribed on the barrels. 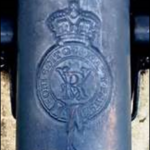 As the Royal Ordnance Factory, whose mark was the Royal Cypher, became responsible for the manufacture of most British artillery, it became customary to inscribe the Royal Cypher on all guns. When, in 1893, Her Majesty, Queen Victoria conferred the title “Royal” on the artillery in Canada, the honour included the right to engrave on artillery equipment the Imperial Cypher VRI surmounted by the Imperial Crown. The honour is perpetuated today by inscribing the Royal Cypher of the reigning monarch on each artillery piece for the current Royal Cypher for Her Majesty, Queen Elizabeth II. Traditionally, the guns of The Royal Regiment of Canadian Artillery are treated as its Colours. They serve the same central role in pride and identity as do the Guidons or Colours of armour and infantry regiments. The custom of the guns being the Colours of the artillery has its origin in the British practice of designating the largest piece in an artillery train as the “flag gun”. This gun was accorded the honour of carrying the equivalent of today’s Queen’s Colour. Use of the flag gun has been recorded as early as 1722. After this period, the guns themselves came to be regarded as the colours of the artillery, as gunners in battle rallied to their guns in the same fashion as regiments of cavalry and infantry rallied to their Colours. The introduction of rockets and missiles has in some cases changed the nature of the artillery’s equipment’s. Consequently, the term “guns” shall be deemed to include all Artillery weapon systems used to inflict damage or casualties on the enemy. 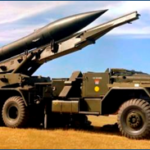 Thus, rocket and missile launchers, despite not being inscribed with the Royal Cypher, will be accorded compliments when they are on ceremonial parade with formed artillery units or sub-units. Compliments are not paid by the troops on parade to the guns during roll pasts or other parade movements. The artillery has no equivalent to the Trooping the Colour ceremony. It should be noted that spectators will pay compliments to the guns, as Colours, during a roll past or during similar movements on formal parades and ceremonies. Although it may be impracticable in modern times to treat guns as Colours in non-ceremonial circumstances, they must be accorded the dignity and respect they deserve. Such practices as smoking on or near the guns, sitting or leaning on them, decorating them for social occasions or leaving them insecure are unacceptable. This respect and treatment should be extended to include all historic Artillery weapon systems. In November 1904, His Majesty, King Edward VII presented banners to the Royal Canadian Field Artillery and the Royal Canadian Garrison Artillery. It was His Majesty’s pleasure to present these banners to commemorate the service of C, D and E (Special Service) Batteries during the Boer War. The banners were officially presented by the Governor General, Lord Minto, in a ceremony on Parliament Hill. A similar banner was also presented to the Royal Canadian Regiment. 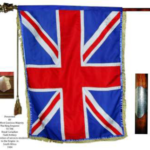 The banners were accorded the honours of colours but did not supplant the guns as the colours of the Regiment. The original King Edward VII Banners were not paraded for many years. By the 1980’s the last remaining Banner, which was located in The RCA Museum, had fully deteriorated. In accordance with Royal Decree, these banners will not be replaced. 84th Independent Field Battery RCA – Honorary Distinction – Defence of Canada, 1812 – 1815 (Non- Emblazoned). Consistent with the Royal Regiment’s traditions, the Canadian Armed Forces has directed that these Honours are subordinate to UBIQUE. In addition to the Honours bestowed on units, War of 1812 Commemorative Banners were presented to those units, recognizing that their heritage embraces service in the defence of North America during 1812-1815. The banner may be carried, flown, or displayed on anniversaries of events of the War of 1812. In accordance with CAF regulations, these banners will not be replaced. The Royal Artillery Standard was approved by the Colonel-in-Chief,His Majesty, King George VI, in 1947. Mgen H.O.N. 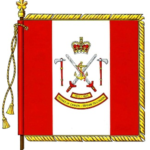 Brownfield, CBE, MC, CD, then Colonel Commandant, applied in 1956, for permission to adopt the Standard for use by The Royal Regiment of Canadian Artillery. This proposal was warmly welcomed by the Master Gunner, St. James’s Park (then FM, the Viscount Alanbrooke) and permission was gladly given. 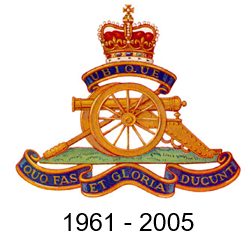 The Royal Artillery Standard was used as the Standard of The Royal Regiment of Canadian Artillery until 31 May 1989. On the recommendation of Artillery Council of 29 April 1988, the Director Ceremonial on 31 May 1989 revoked the authority for units and sub-units to place formation and unit badges, designators, devices and traditional crests on the RCA Standard. At the same time, the Director Ceremonial approved the addition of a gold maple leaf in the centre of the field between the gun badge and the first white diagonal, and the addition of the seventh flame to the grenade. 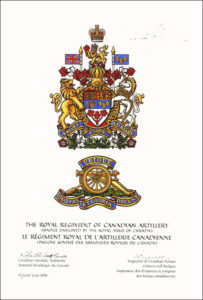 This version is the currently approved Royal Canadian Artillery Standard. Visits of senior civilian dignitaries or allied officials of comparable rank. On such occasions, the Standard may be flown at all artillery headquarters including formations, units, sub-units and artillery schools. The Colonel Commandant may, at his discretion, on special occasions, fly the Royal Canadian Artillery Standard at his residence. Camp flags are used in garrison and bivouac to mark the location of artillery units. They may be flown at headquarters, camps and bivouacs daily from sunrise to sunset. They are not to be carried on parade. Artillery pennants are authorized for use by field officers and above who are commanders of sub-units, units, or formations. The Artillery pennon is a narrow swallow-tailed type of pennant borne at the top of a lance; it has equal fields of artillery red-over-blue colouring. They are not command pennants and are not flown from flagpoles or vehicles. 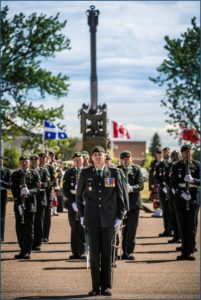 As befits its traditions as a mounted corps, The Royal Regiment of Canadian Artillery uses the artillery pennon fitted to the light cavalry lance on certain training and ceremonial occasions. They are used when fitted to a lance by soldiers who are posted as ceremonial parade markers in RCHA/RCA full dress. No badges or crests of any description will be placed on the pennon. They are not carried on unit or formation parades. 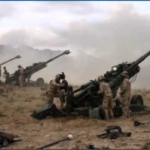 They may only be carried by formed troops undergoing basic artillery qualification training. Affiliated Army Cadet Corps are also authorized to carry the pennon. Only Artillery troops conducting basic qualification training and affiliated army cadet corps may place troop or corps designators on the pennon’s obverse side. 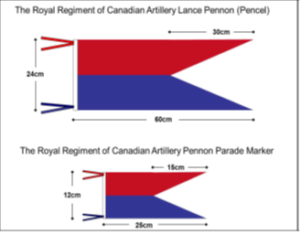 The RCA Parade Marker pennon is a small version of the RCA Pennon; it has equal fields of artillery red-over-blue colouring. The Royal Regiment of Canadian Artillery uses the small artillery pennon fitted to the post of ceremonial parade markers. An artillery parade is always handed over with the ranks in the position of at ease. This applies at all levels of command up to and including the commander of an artillery formation. 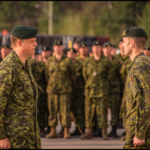 However, artillery sub-units, units and formations will receive an inspecting officer with the ranks in the position of attention. This practice dates from the period before recoil mechanisms, when guns had to be run back by hand into the firing position. After hours of sponging, loading, firing and running the guns back into battery, the gunners were exhausted. Commanders extending their congratulations to gunners for their contribution to victory granted them the privilege of receiving these accolades at ease rather than at attention. All ranks serving the weapons and equipment of The Royal Regiment shall carry out their duties at the double unless orders to the contrary are issued and except when handling ammunition. Bayonets will be carried by Artillery personnel who are issued with rifles and bayonets. The artillery does not, as a matter of routine, fix bayonets except when ordered for ceremonial parades or when on guard with members of other corps or branches carrying fixed bayonets. A commanding officer of a regiment or independent battery may employ a trumpeter. The trumpeter will parade four paces behind the commanding officer and will conform to his movements. Both trumpet and bugle are carried. The trumpet is normally carried in the hand. The bugle cord is slung over the left shoulder; the bugle hanging on the right side. A salute is a gesture of mutual respect and loyalty. Salutes are exchanged smartly and we look one another in the eye. 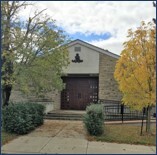 The Royal Regiment of Canadian Artillery Home Station Officers’ Mess is located at CFB Shilo, MB. 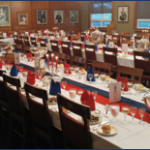 Its abbreviated name is The RCA Officers’ Mess and its Gunner traditions are maintained by the artillery officers located at the Home Station on behalf of all Canadian Gunners. The original post-Second World War officers’ mess in Shilo was the combined mess of 71st Field Regiment, Royal Canadian Artillery (later designated 1st Regiment, RCHA), 127th Anti-Tank Battery, 68th Medium Battery and the Royal Canadian School of Artillery. During this period there were also artillery officers’ messes at the Royal Canadian School of Artillery (Anti-Aircraft) at Picton, ON, the Royal Canadian School of Artillery (Coast and Anti-Aircraft) at Esquimalt, BC, and the combined mess of 128th and 129th Anti-Aircraft Batteries, RCA at Gordon Head, BC (which was normally referred to as the Gordon Head Officers’ Mess). On the amalgamation of the three artillery schools in August 1960, the Officers’ Mess in Shilo became the home mess of the Regiment. The home mess of the Warrant Officers and Sergeants of The Royal Regiment of Canadian Artillery is The Royal Canadian Artillery Home Station Warrant Officers’ and Sergeants’ Mess, located at CFB Shilo. 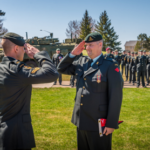 As the home station messes are repositories of much in the way of RCA artefacts, memorabilia and tradition, they receive support from the RCA Regimental Fund, the RCA Heritage Fund and The Royal Canadian Artillery Association. All officers of The Royal Regiment of Canadian Artillery are honorary members of the Royal Artillery Officers’ Mess in Larkhill while on duty in Britain. The RCA Officers’ Mess in Shilo extends reciprocal privileges to Commonwealth artillery officers. If music is available, the first six bars of “God Save The Queen” will be played before the Loyal Toast is drunk. Each officer present will say “The Queen” or, “La Reine” before drinking the toast. 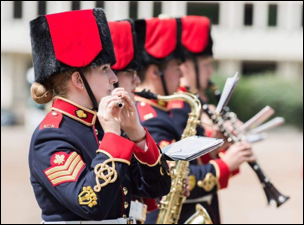 The Royal Regiment possesses a rich musical heritage which we celebrate on the parade square and in our messes. The Royal Artillery Slow March was composed by Her Royal Highness, The Duchess of Kent (the mother of Queen Victoria) and is the principal artillery march. It is played by all artillery units as the Regimental Slow March for dismounted parades and at concerts and dinners. Recall that as Gunners, at dinners in our own messes, we remain seated during its playing. The British Grenadiers dates to 1779 but the tune is older still. It was one of several marches used by the Royal Artillery in the first half of the 19th century along with “The Artillery Grenadiers”, “Geary Owen”, “I’m Ninety Five” and “Highland Laddie”. By 1855, however, custom had determined “British Grenadiers” to be the Regimental Quick March. Keel Row for RCA mounted parades (Trot Past). Bonnie Dundee for RCHA mounted parades (Gallop Past). The Post Horn Gallop was written by the German cornet player Hermann Koenig in 1844 Post Horn Gallop as a solo for post horn with orchestral accompaniment – the post horn being an instrument used to signal the arrival or departure of a post rider or mail coach. It was used especially by postilions of the 18th and 19th centuries.